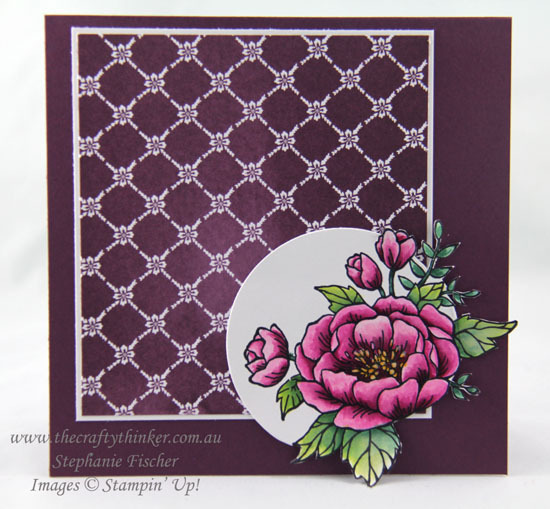 I'm so glad the Birthday Blooms stamp set continued into the new Annual Catalogue - I have such a fondness for it! In this card, I have paired it with the new Fresh Florals Designer Series Paper Stack in the new In-Colour, Fresh Fig. The base card is a 5.75" square made from an A4 sheet. There is a Whisper White layer behind the patterned paper. I stamped the blooms with Basic Black ink onto Whisper White cardstock and then watercoloured the image with Berry Burst, Fresh Fig, Lemon Lime Twist and Tranquil Tide inks with a touch of Crushed Curry in the centre. Once coloured, I used the Out of the Box die cutting technique and the largest Layering Circle die to create a little interest. I left the rest of the card plain and simple. If you live in Australia, don't have (and are not) a Stampin' Up Demonstrator and would like a 2017-2018 Catalogue - do contact me.